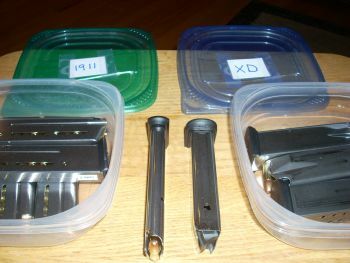 Single stack 1911 on the left. Double Stack XD9 on the right. These are very different magazines. This photo shows the width difference well. The other difference is the capacity. The 1911 maxes out at 10 rounds. The XD9 will carry 16. So why did I buy the 1911? A single stack magazine results in a narrower grip. And I have very small hands. Since I had my gun, but no magazines, one of the guys working at the shop joked about, “taking the time to make lots of single shots” and I jumped on that comment. I’d always wondered if you could load a semi-automatic by placing a round in the barrel. (Note: if the terminology is incorrect please do correct me in the comments!). Since none of the classes I’ve taken has mentioned this I thought it might be a dangerous practice but if I’m ever in a situation where I have a gun, no magazine and a pocket full of rounds I would want to know the answer. So of course I asked. The answer: it’s possible but can damage your extractor. Typically the round slides in from behind the extractor and the rim slips into the lip of the extractor. If you hand load the round and then close the slide, the lip of the extractor is forced over the rim of the round from behind the round. Long story short: you can do this but it may damage the gun over time by breaking the lip off the extractor. I found more discussion here. A final comment about my visit to the shop yesterday: some of the staff are becoming friends. I show up on a regular basis, I’m willing to listen to many opinions, and I always try to be upbeat and positive when I’m there. It’s a good feeling to see friendly faces when I walk in the door. My guns do not, but one of the ladies I compete against does have a gun configured this way. It causes delays in the competition when the RSO asks her to unload and show clear, pull the trigger (to verify it’s unloaded), then holster. She has to drop the mag then put it back in to pull the trigger on the unloaded gun. For competition I wouldn’t choose a gun with this configuration.